Here are Some Easy Ways for Any Agent to Make Your Listing Photos Look Better! Photos can make or break the sale of a listing, yet not all agents are able to hire a professional photographer. 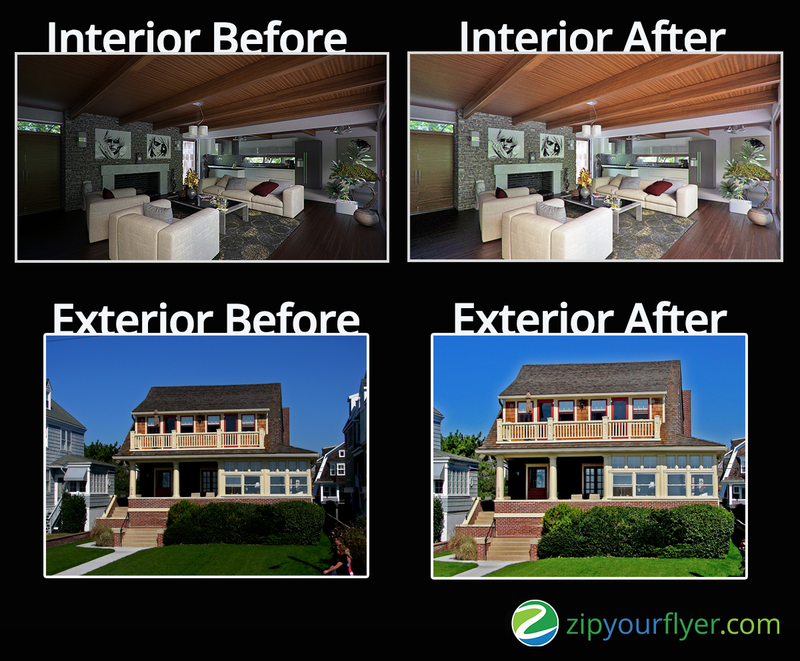 At Zip Your Flyer we see hundreds upon hundreds of listing photos per day and these tips and tricks can really make a difference for your listing without the photos looking overly produced. Many agents aren’t aware of the simple free photo editing solutions they already have at their disposal, or perhaps they aren’t quite sure what settings they need to adjust and how to use these free programs. 1. There is often too much sky in the exterior image, or the photo is too zoomed out. 2. Are there actual people in the photo?? See the “before” example shown with people on the sidewalk – simple cropping gets them out of that corner. 3. Too much darkness either on exterior or interior photos. Here are some simple photo editing tips that are easy and can be achieved no matter the device you are using. Are you using your smartphone for photos? Mac Photos or Windows Photos). Once you are viewing a photo on your phone there is usually an Edit option, then a Light/Brightness option. One commonly unknown setting further into these menus for brightness is called Shadows. When you select to edit the Shadows, this will increase the dark areas in your photo without washing out the entire image. This will really brighten up your photo and make the rooms look filled with light and larger in size. Are you using a digital camera? The same edit tools as above can also be found when using most digital cameras. Before uploading your photos from your digital camera to your computer try to view them on the camera itself. Then take advantage of the camera’s built-in editing options for Light/Brightness and also the option for Shadows. 1. Playing around with the contrast isn’t bad per se, just don’t overdo it. 2. Feel free to try and increase color saturation, but again, overdoing it can lead to the colors looking too vibrant and obviously manipulated. Both your phone and camera also have cropping options, sometimes just taking a step back and really looking at the photo to get rid of some of the neighbor’s house, or some of the sky can bring the house into focus better. I hope these tips help, small editing can make a huge impact on your listing photos.